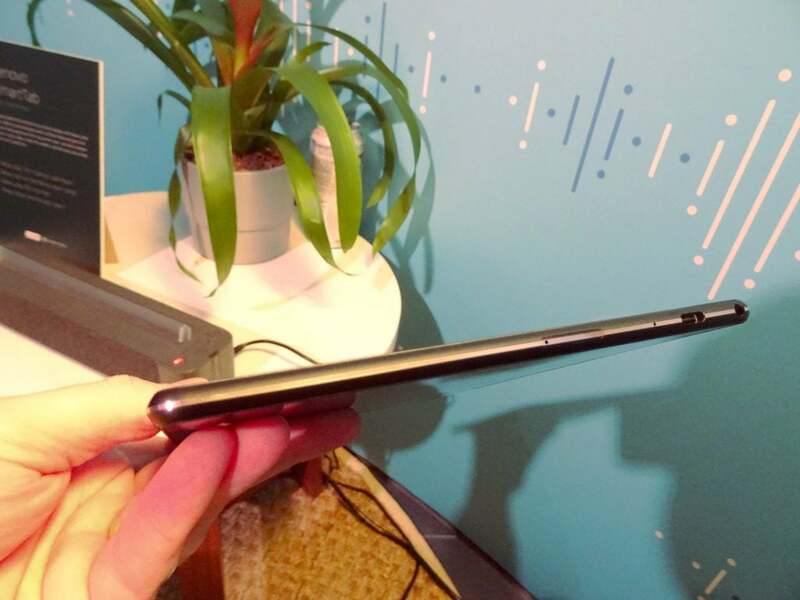 Lenovo’s Smart Tab P10 is a really interesting proposition. We’re used to the phrase ‘2-in-1’ being used to describe tablets that could comfortably double as laptops (and vice versa), but this is a different kind of 2-in-1. UK prices aren’t yet available, but Lenovo says that the 32GB+3GB version will cost $299, with the 64GB+4GB edition costing $329 in the U.S. You’ll be able to pre-order the Smart Tab P10 later in January, but release dates haven’t yet been published. Not only does it support Amazon’s voice assistant Alexa and Amazon’s Show Mode – the same Alexa visualisation software seen in 7th gen Amazon Fire tablets – the Smart Tab P10 also supports every Alexa Skill going, meaning that this has the potential to control your central heating, turn off the lights in your living room, basically control any aspect of your connected home, provided there’s an Alexa Skill for it. It’s got the potential to be an Everything-in-1. Or, if you just want to use it as an all-round entertainment hub, well it promises to do that just fine too. Show Mode is particularly impressive, as it sees things like weather information and, when you’re streaming playlists from Amazon Music, song lyrics displayed on the screen. You can simply pop the Smart Tab P10 into the dock and say something like ‘Alexa, play the BumbleBee trailer’ and it’ll go and do its thing. Far field mics in the dock mean that the Smart Tab P10 should be able to hear you from across the living room, kitchen – or wherever you set it up. The Smart Tab P10 itself is a fairly standard-looking Android tablet with a Type-C USB port, 3.5mm headphone jack and a microSD card slot. The rear features a glossy coating with a lenticular effect, similar to what we’ve seen on phones like the Honor 10. Like that phone, the Smart Tab P10 had some nice fingerprint marks on it, so I gave it a quick wipe before taking my pics – it cleans up easily enough. Talking of fingerprints, there’s a scanner here, which will let you quickly unlock the tablet. As this is a home device, intended to be used by multiple family members, the idea is that everyone in your home scans their fingerprint, and when they unlock the Smart Tab P10, they’ll be taken to their own profile page, which can be customised with wallpapers, apps, games and files. Parents will also be able to activate a ‘kid’s mode’ which will load up curated, age-appropriate content for their children. The Smart Tab P10 is otherwise a fairly normal-looking Android tablet – you get a combination microSD and nano SIM slot, USB-C and a 3.5mm jack. Geared towards streaming content, the Smart Tab P10 features four front-facing speakers with Dolby Atmos support. 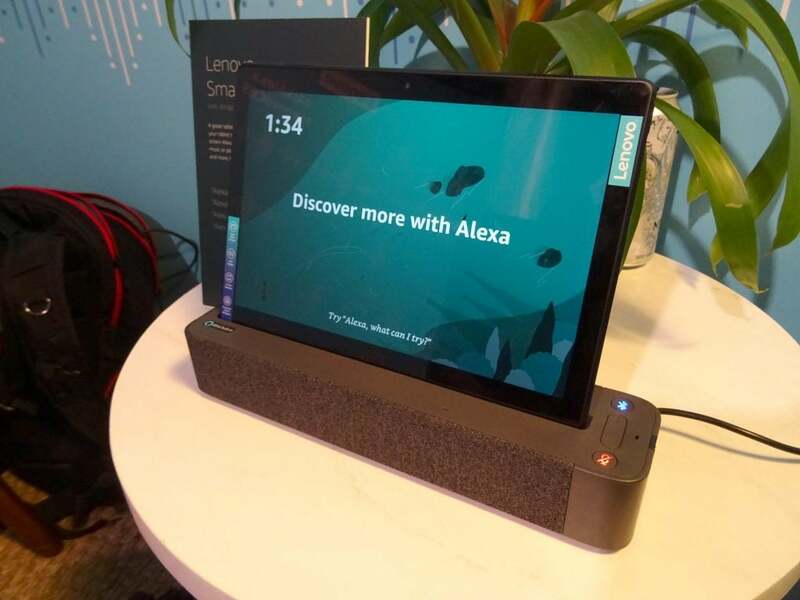 While you will be able to activate Alexa just when you’re holding the tablet, for home use, you’re better off using the dock, as it features three far-field mics, and blasts sound out of two 3W speakers. While it’s designed primarily to support the Smart Tab P10, you can, in a pinch, use the Lenovo Smart Dock as a Bluetooth speaker. The dock itself is covered in light grey woven fabric that’s not a stone’s throw away from the fabric styling of the 2nd gen Amazon Echo. A thin transparent plastic buttress rises out of the centre, providing support for the Smart Tab P10. There are volume controls in between Bluetooth and mute buttons to the right and over on the left a little sticker proudly declares that the system features ‘Alexa Built-In’. 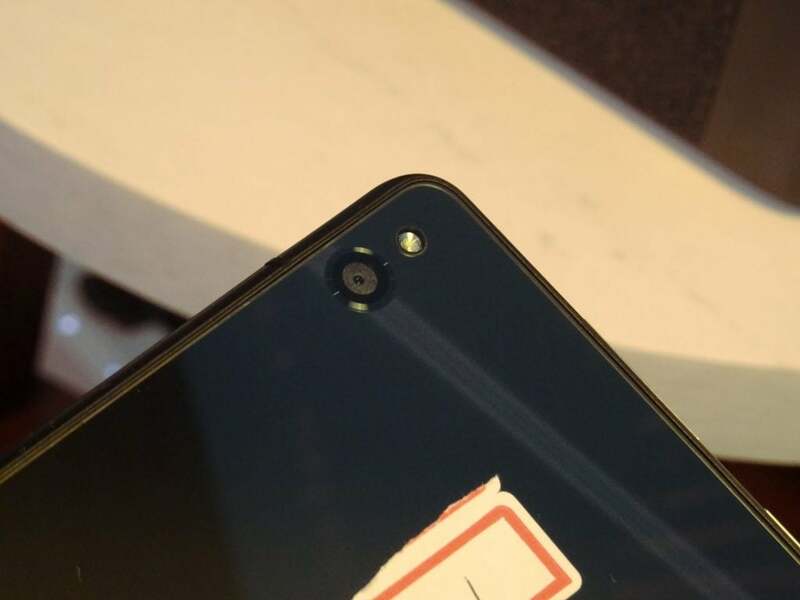 Should you want to take pics, there’s an 8-megapixel camera with autofocus on the back of the Smart Tab P10. The Smart Tab P10 has the potential to be a hit, especially with families, or anyone after a combination entertainment/smart home hub. It’s great to see some of Amazon’s better features like Alexa and Show Mode integrated and working well on a non-Amazon device. It’s even better to learn that this versatile tablet and smart home speaker system won’t cost that much either (assuming the the UK prices don’t end up being too far away from what you’d pay in the States). 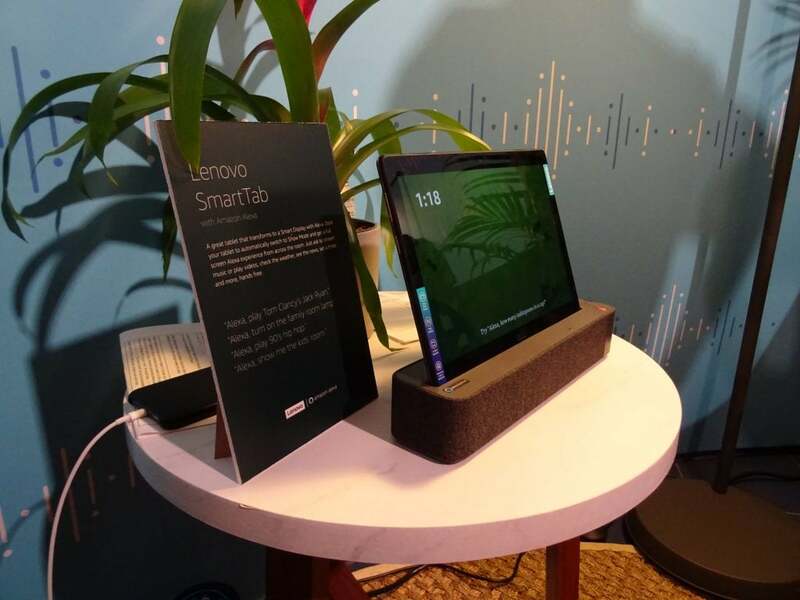 When you consider that you’re getting an Android tablet with four Dolby Atmos tuned speakers and a smart home assistant rolled into one, the Lenovo Smart Tab starts to look like a very compelling package. The post Lenovo Smart Tab P10 first look: A tablet and smart home hub rolled into one appeared first on Trusted Reviews.